"Stained Art Glass FLEUR DE LIS Suncatcher" Here's a classical decorator motif modernized with one of today's most popular color palettes! Beautiful green, red, and frosted pink on crystalline glass make this design perfect in any decor. 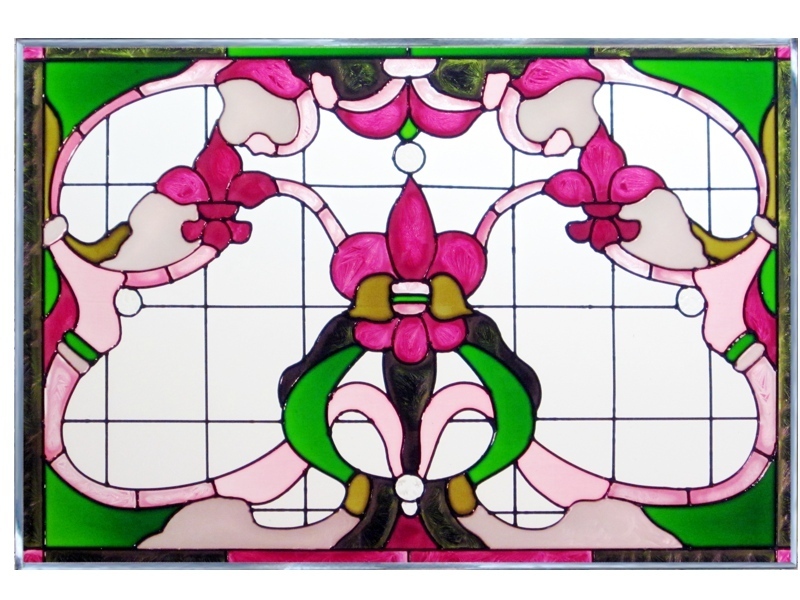 This hand-painted horizontal art glass panel is zinc-framed and measures 20.5" wide x 14" high. It features two soldered metal rings along the top for hanging. PLEASE NOTE: Shipping ONLY within the continental U.S. **Hawaii, Alaska, and Puerto Rico residents please contact seller for shipping quote before ordering.